Home » Football » Football Cards » What’s in the Cards for the 2012 Super Bowl Commercials? What’s in the Cards for the 2012 Super Bowl Commercials? The Super Bowl has become one of the world's biggest television spectacles, not just for the game but because of the entire package. Snacks, parties, 12-hour pregame marathons and half-time spectaculars have all become a part of the ritual. Perhaps the biggest sideshow of them all is the lineup of Super Bowl commercials. A 30-second spot during the 2012 Super Bowl costs $3.5 million. And that's just the airtime. Companies have to pour even more money into making something memorable and worthwhile. It almost makes Albert Pujols' new contract look like a bargain. In order to get the most out of their investments, more and more companies are taking to the Internet to showcase their Super Bowl commercials in advance, offering advanced looks and extended cuts. Several 2012 Super Bowl commercials that have already aired have trading card connections. So if you're looking to commemorate this year's game a little differently, here are a few trading cards that might trigger some memories down the road. Honda CR-V - "Matthew's Day Off"
The Super Bowl commercial generating the most buzz this year plays off the classic comedy, Ferris Bueller's Day Off. The ad, which promotes the Honda CR-V, stars Matthew Broderick and is the closest thing we'll likely ever come to a Ferris Bueller sequel. Broderick has one autograph card and it's a tough one to find. 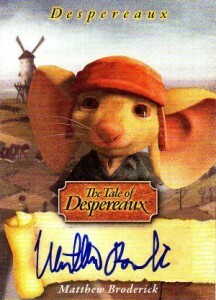 The card comes from Upper Deck's set for the family film The Tale of Despereaux. Both the movie and the set flopped. While boxes are cheap, autographs are extremely tough to find. Also hindering the card is the fact that it pictures an animated mouse and not the actor. 2012 Acura NSX - "Transactions"
Another 2012 Super Bowl commercial generating a ton of buzz sees Jerry Seinfeld push the 2012 Acura NSX. Unfortunately, the comedy legend has yet to sign for a trading card set. In fact, he only made his first trading card appearance in the recent 2011 Topps American Pie set with a card commemorating Seinfeld's premiere. 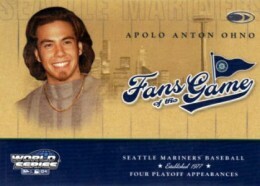 However, there's another iconic cameo in the commercial who has several trading card options. The name Larry Thomas might not ring a bell, but if you mention the Soup Nazi and, "No soup for you!" will likely pop into your head. Although Thomas has appeared in several films and shows, it's the one guest appearance on Seinfeld for which he'll likely be remembered. 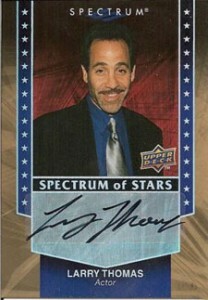 Thomas' first autograph came in 2008 Upper Deck Spectrum Baseball as part of the Spectrum of Stars Autographs insert set. Since then, his signature has appeared in 2010 Razor Pop Century, 2011 Leaf Pop Century and 2011 Topps American Pie, where he also has a wardrobe relic. Given the actor's success outside of Seinfeld, these cards can be found relatively cheap. Bucking the trend of releasing their full ads in advance of the game, Century 21 has simply put out some 2012 Super Bowl commercial teasers that feature a pair of big-name athletes. 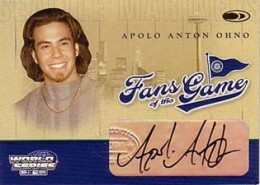 The first has gold medal speed skater (and Dancing with the Stars winner) Apolo Anton Ohno, who was included in the cross-brand Donruss Fans of the Game set that debuted in 2004. Ohno's base version is relatively tough to come by today. When it does, expect to pay around $10 for it. The autographed version is numbered to 300 copies and pops up very rarely. Both cards were inserted in 2004 Donruss World Series. The second Century 21 2012 Super Bowl commercial features football Hall of Famer Deion Sanders. No stranger to the hobby, Sanders has about 3,500 total cards for both football and baseball. 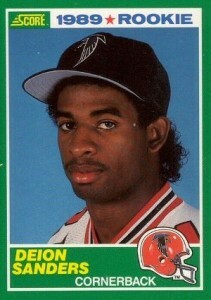 His most iconic rookie card comes from 1989 Score Football. Deion Sanders autograph cards are also popular with collectors, usually going for $50 to $100, depending on the set and print run. Volkswagen - "The Bark Side"
Is there anything more "Internet" than Star Wars and pets doing silly things? Probably, but we're not going there. Following up on their instant-classic Darth Vader kid commercial from last year, Volkswagen has a group of dogs barking the Imperial March. Simple but funny. Extra points are given for the dog in the Ewok costume. And yes, they do have Star Wars costumes for dogs. Over the years, there has been no shortage of Star Wars cards. Sticking with the Vader theme, both actors who played the villain have several autograph cards. 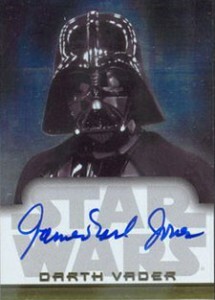 James Earl Jones' first autograph came in 2001 Topps Star Wars Evolution. Limited to 1,000 copies, it's still an extremely popular card. Since then, he's also been in 2004 Topps Star Wars Heritage, 2006 Topps Star Wars Evolution Update and 2010 Topps Star Wars Galaxy 5, as well as several other non-Star Wars sets. While Jones provided Vader's voice, the man inside the costume was David Prowse. 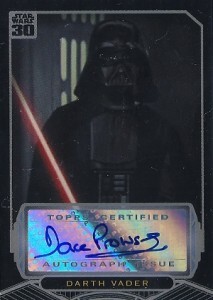 The actor's first autograph came in Topps' 2007 Star Wars 30th Anniversary. Since then, he's appeared in 2010 Topps Star Wars Galaxy 5 and 2010 Topps Empire Strikes Back 3D, as well as a handful of celebrity-themed sets. While there are plenty of players on the field to collect from this year's big game, the 2012 Super Bowl commercials offer some extra fun for collectors. There's bound to be some surprises once Super Bowl XLVI rolls around, but for now, this list is a good start for collectors.